LAS VEGAS, May 3, 2017 /PRNewswire/ -- Today at JiveWorld17, Jive Software, Inc. (Nasdaq: JIVE) announced Jive Labs—the first inter-organizational virtual research lab that connects network science researchers in industry, academia and Jive to solve some of the most complicated network organizational business problems in order to advance the ecosystem performance of individuals and organizations. Jive Lab's first area of focus is on how collaboration, based on the science behind networks and the workgraph, can lead to cutting-edge solutions that accelerate innovation and go-to-market execution in large enterprises. Jive Labs charter members include leading institutions, such as the University of California, Santa Barbara, whose Technology Management Program specializes in organizational sciences, and the Connected Commons community, which is dedicated to exploring how social network science improves the performance of individuals, organizations and society. At JiveWorld17, Jive Labs unveiled its first breakthrough—an organizational network intelligence prototype that is designed to make measurable impact on business operations. By teaming up with third-party academia and research organizations, Jive's goal is to broaden the research ecosystem and support independent efforts to help companies maximize the way they work. Jive Labs' first breakthrough extends Jive's successful insights and analytics portfolio, including People Analytics, to unify the Jive WorkGraph™ through universal identification, content and search and enable organizational network analysis (ONA). This new ONA technology provides visibility into how work really gets done, uncovering the work patterns of information flow, collaboration and activity, thus allowing enterprises to make strategic choices that shift collaboration from chance interactions to deterministic outcomes. 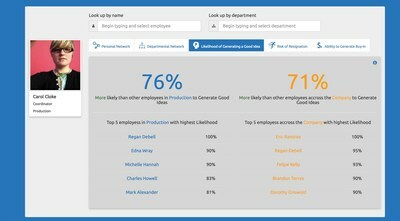 During the conference, Jive demonstrated how the prototype can proactively recommend a team with the most impactful employees from across a large organization for strategic projects based on the Jive WorkGraph, and an additional use case surrounding how the collaboration hub can drive predictive behavior analytics. Jive's partnership with Connected Commons brings over 20 years of collective community research to the task of finding new ways that work can deliver breakthrough results in a connected economy. With dozens of high-impact members, including Cigna, GM, GE, Workday, Boeing, Cisco and Microsoft, the open source community shares best practices and scientific research, and co-creates solutions and tools that enable organizational success. "I've dedicated my career to researching how organizational relationships and informal networks can provide competitive advantage. I've worked with almost 300 leading organizations around the world in virtually every industry, including pharmaceuticals, software, financial services and government, to advance our knowledge of how ONA can positively impact any business and increase go-to-market execution," said Rob Cross, PH.D, professor of global business at Babson College and a Connected Commons core team member. "It's great to see collaboration experts like Jive embrace the importance of ONA and work with the community to help turn research into real technology that will drive fundamental change in how businesses operate. I look forward to continuing to partner with Jive and the broader research ecosystem as we unearth new workplace insights that address real world business problems." "UCSB's Technology Management Program specializes in how companies can design their organizational networks and implement new technologies to more effectively create and share knowledge. We also explore how data intensive technologies, such as simulation and social media tools, enable new ways to access, store and share information," said Paul Leonardi, professor of technology management at University of California, Santa Barbara. "Our recent engagements, including with Jive Labs, have centered on helping companies to improve communication between departments, using social technologies to enhance internal knowledge sharing and strengthen global product development operations. We are thrilled to directly contribute to the new ONA prototype, which we foresee having tremendous impact on go-to-market execution." "In our ever-disruptive networked economic environment arising from the digitization of fast-growing, highly interactive, collaborative connections among people, devices and businesses, the traditional corporate structure is in need of re-thinking," said David Puglia, chief marketing officer at Jive Software. "The initial research of Jive Labs using collaborative activity insights to help solve complicated network organizational business problems that advance the ecosystem performance of individuals and organizations is very timely. We are excited to be part of this innovative approach to 21st century organizational research."